Somewhere, I think in a comment on this blog, I mentioned that we will know when BMW have swapped their expectations from Heidfeld to Kubica: they will put Nick on low fuel in qualifying instead of Robert, who will have a more race-aware fuel level. It happened rather earlier than I expected - in Malaysia, only the second GP of the season. So does this mean that Kubica has become BMW's first hope for the race, while Heidfeld is given the chance to fight with the leaders in the early laps? To be quite honest, I'm not sure. The earliness of the change makes me think that the team is experimenting, perhaps hedging their bets by alternating the driver who gets light tanks in each race. This would make some sense as it would tell them if either driver takes better to the unaccustomed fuel load instead of his usual strategy. The first two races have been inconclusive, however. 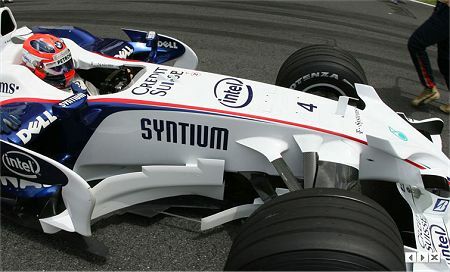 Kubica qualified ahead of Heidfeld in Australia, as expected, but then had his race spoiled by an incident with Nakajima. Heidfeld, the man on the strategic fuel load, finished in second place. In Sepang, the German had the lighter fuel load but his hot lap was compomised by the famous incident with the McLarens. He started behind his team mate as a result. But the final placings were much as in Melbourne, except the other way around - Kubica second, Heidfeld sixth. It doesn't really help Theissen to decide which of his drivers should continue to be the hare and which the banker. They seem to do equally well on sensible fuel loads, although Heidfeld is perhaps a shade the more reliable of the two when running lighter. And the puzzle is only made more difficult by Heidfeld snagging fastest lap in Malaysia, underlining the fact that his best race laps have been better than Kubica's in both GPs. I suspect that Kubica will be back on light tanks for qualifying in Bahrain, if only to allow the good doktor more time to make up his mind. BMW must be quite pleased with their results so far, however. Two second places and a sixth puts them second in the Constructors' Championship, the drivers are 3rd and 5th in the Drivers' Championship, and the car was equal to the race pace of the McLarens in Sepang. The goal of a race win is yet to be achieved but the team remains ahead of expectations for this stage of the season. The Bahrain GP is likely to yield similar results as none of the teams are able to make big changes to the cars until the return to Europe. From Barcelona onwards, however, the race to improve becomes imperative and this is where I expect BMW to shine. They are within a few hundredths of a second of equality with the top two and have a car with great potential for development. Throw in a little luck and that first race win should not be long in coming. Well Clive, there's at least two questionmarks in the way of BMW, namely Ferrari and McLaren. I think they both will make considerable changes to their cars ahead of Bahrain. Ferrari because there's been quite a few engines failing in the two first races, mostly customer engines but even that should make them take a look at their own engines to. McLaren had a really different race in Malaysia compared to Australia, so i think that they will have to revise quite alot of settings and configurations before they go to Bahrain. They on the other hand don't seem to have any problems at all with the reliability of the cars. And then there's Toyota, who really have become the surprise in the start of the season. At least in Malaysia. So in some ways i think that they could improve even more before Bahrain, and this could really be their best season since they entered F1. And that would be a welcome surprise to me, even though i left the comments i did a few posts ago. There must have been some smiles on the lips of Trulli in the last few days. And, of course BMW must have some surprises in their stack of upgrades coming in the last few weeks. In the way they have been talking them selves up during winter testing and considering how well they did in Australia with Rosberg on the podium, i think they are a force to consider this season. Oh! And really of topic. About this page and the verificationcode we have to enter before being able to post our comments. Would you please ask Mad if he just could ad an update button next to the box providing the numbers, so that we could update them before posting because they never really last as long as it takes to write a comment. Sorry for the error there. Of course i meant Williams in the last little column about the teams. I intend to have a look at all the main contenders this week, Björn, assessing their performance so far and guessing what the future holds for them. No doubt Ferrari and McLaren will be doing whatever they can to solve any problems that have risen so far before Bahrain but so will BMW. It is most likely that we won't notice any change in the relative competitiveness of these three teams until the European races. I think BMW will continue to alternate the fuel loads all season unless one driver obviously fares better on one version of the fuel load. The new rules mean that one car cannot have the same fuel load as the other, so only one can run at ideal speed in qualifying and only the other can take the optimum strategy into the race. BMW appear to be making this into a virtue by alternating a "qualifying car" with a "race car". In the interests of fairness, they're not going to lumber one driver with only playing one role. Long may it (and the rest of their approach) continue to work for BMW. I would add though that Heidlfeld was up as high as third place by the first corner until Trulli ran wide and squeezed him out which is why he then dropped down to about tenth - this was a real chunk of bad luck, and coupled with the McLarens in qualifying it explains why he was so far behind. I'd still bet that Nick is the better race driver at this moment in time, but Kubica certainly isn't far behind. If BMW continue to develop this car and can still devote time and effort to next year's car as well then 2009 will really see the sparks fly. They must keep Heidfeld and Kubica though, they must surely be about the strongest driver pairing on the grid. Oh, and I'd second the suggestions about the codebox timing out too quickly!! It will become really interesting if BMW really do alternate the hare/tortoise strategy this year, Alianora. Last season it was invariably Kubica that was the hare and a lot of people assumed he was quicker than Heidfeld as a result, always qualifying ahead. But we might get a much better idea of their relative abilities now. Thanks for reminding me about Trulli pushing Heidfeld at the first corner, Craig - I was going to mention it in the post but it was forgotten amongst everything else I wanted to say. It was very bad luck for for Heidfeld and, had it happened between say, Hamilton and Alonso, there would have been storms of outrage. In Trulli's defence, I should point out that there was another car inside his, also forcing him to the outside of the corner. "that's easy to say. I think they might surprise you yet!." That's what I've been telling Pooty. So what are we going to do about the CAPTCHA problem, Mad? I'll see if I can lengthen the session timeout on the server.